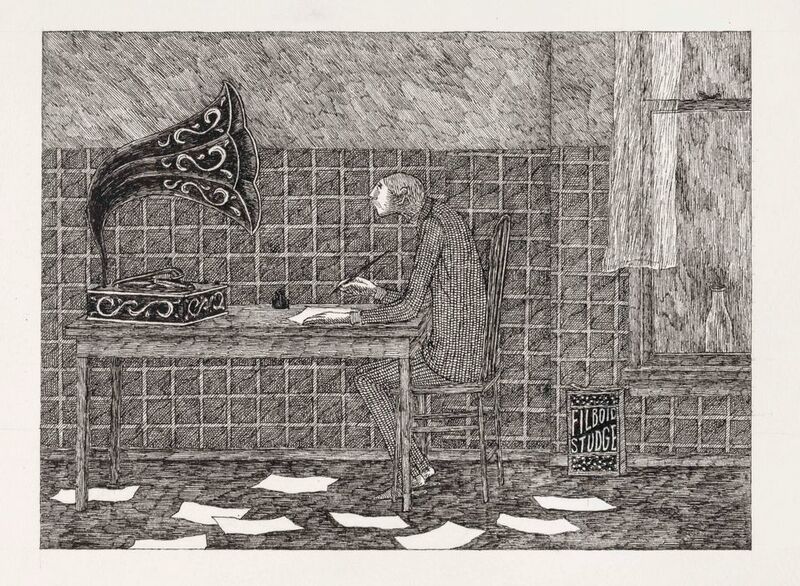 Like James Thurber or Maurice Sendak, the American draughtsman Edward Gorey (1925-2000) had an unmistakeable style and instantly recognisable image world. Most of his drawings—in black and white—depict dark Edwardian interiors or settings, uneasy, enigmatic characters in period dress and fantastical human-animal hybrids. Throughout the 1950s and 60s he was a cult author, creating narratives such as The Doubtful Guest (1957), The Bug Book (1959), The Hapless Child (1961) and The Curious Sofa (1961). His work soon joined the mainstream through publication of cover illustrations for The New York Review of Books from its foundation in 1963, and then became available to a much wider audience in multiple re-printings and collections. Although his connection with the Wadsworth Atheneum was somewhat tenuous (perhaps through occasional, unofficial visits or the very brief involvement with his hero, the choreographer, George Balanchine, who favoured the museum), he bequeathed it his art collection.